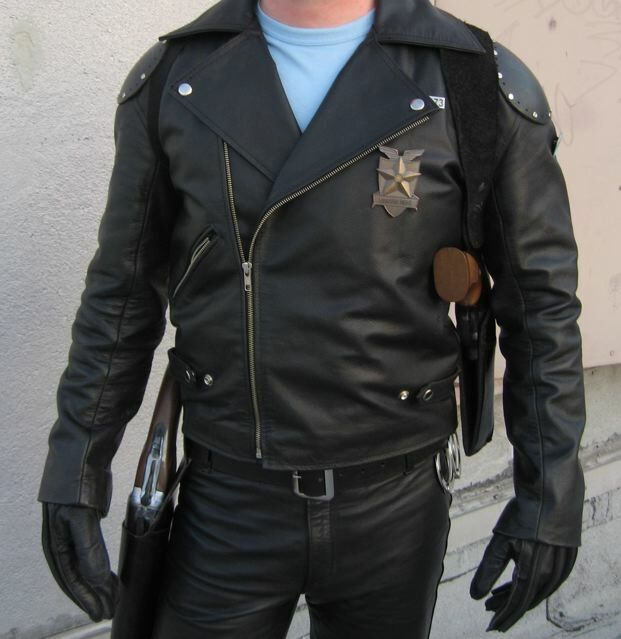 This is about as accurate as it gets for a complete version of the uniform Mel Gibson wore in the first Mad Max movie. I know of only a few fans out there that have one this complete (hi guys, you know who you are). I used the Southbeach jacket, not the Abbyshot. 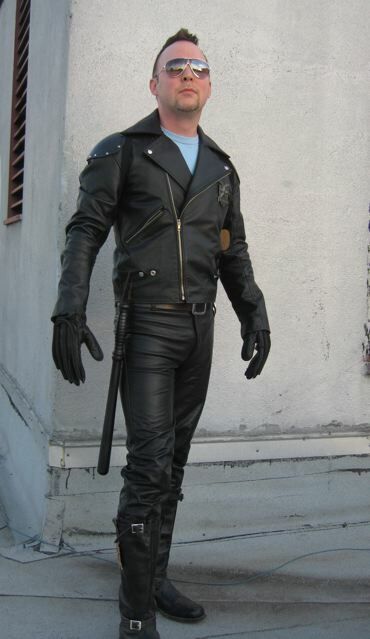 The main reason was price, but the Southbeach jacket does have a few advantages: It is cut shorter at the waist (the Abbyshots are cut too long), it tapers in at the waist (the Abbyshot flares out, which is incorrect), and it’s not as hot for us California boys (the Abbyshot has a very warm liner). On the downside, the leather on the SB is lower quality, the adjustment tabs are a bit too high, and the shouldercaps it ships with are no good. I replaced my shouldercaps with some that I cut from a plastic baseball helmet, using the measurements of an Abbyshot shouldercap. The sunglasses are from eBay and are not available anymore. Which is unfortunate as they are the closest style I’ve ever found to the originals from the movie (aside from the Japanese replicas). They’re the right shape, have the signature oval cutout between the lenses, and they’re the correct smoke/grey color and not brown/amber. (You’ll see in the photo that there are some cracks in the lenses. They’re not that noticeable once the glasses are on, but I may still consider replacing the lenses at some point). 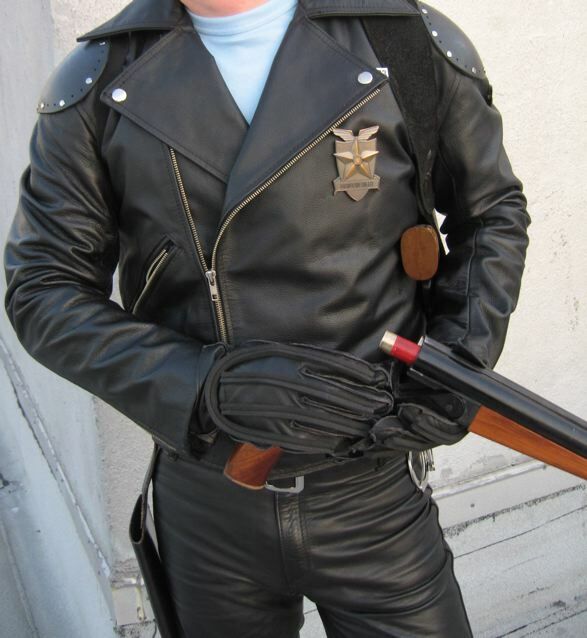 In some of the shots above I’m wearing the baton, and in some I’m wearing the shotgun. That’s because Max never wears them both at the same time in the movie (though I sometimes violate that). The handcuff are the rarer, screen-accurate three link style. Pants are from Southbeach leather, ordered custom-sized and with no pockets. The gloves are the “motobiker” gloves from eBay, modified to be a bit more SA. I believe that once modified these are actually a bit more SA than the Abbyshot gloves. 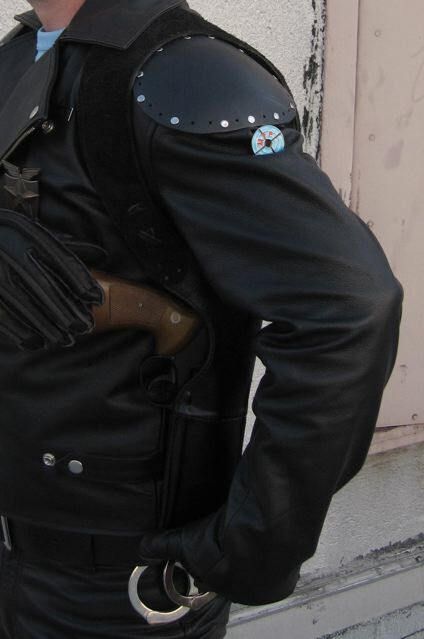 The shotgun holster was made by Magnolia leatherworks in Georgia to my specifications. They now make them for other fans as well. There are actually two shotguns in the pictures. 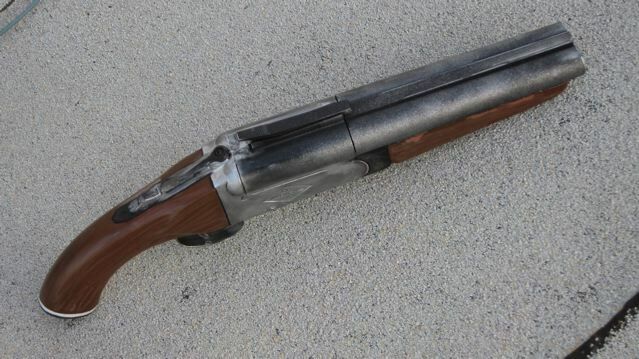 I have a plastic airsoft one that I painted up with the Mad Max One paint scheme (I also filled in the screw holes and things like that) and I have a Hudson wood and metal blank-firing replica (that’s the one in the shot where you see me putting the blank shotgun shell into it). The Hudson is the one I use for my Road Warrior outfit, so it has the Mad Max 2 paint scheme. The blue t-shirt is a genuine Bonds shirt just like in the movie. It took me years to find and was still sealed when I bought it (and in my size no less). The boots in some of the shots are genuine vintage Australian Rossiter aka Rossi motorcycle boots, just like the ones in the movie. In some of the shots I’m wearing my replica Rossi boots that I had custom made. It is VERY hard to tell the two pairs apart, even up close. The revolver is an airsoft replica that I did some custom painting on. 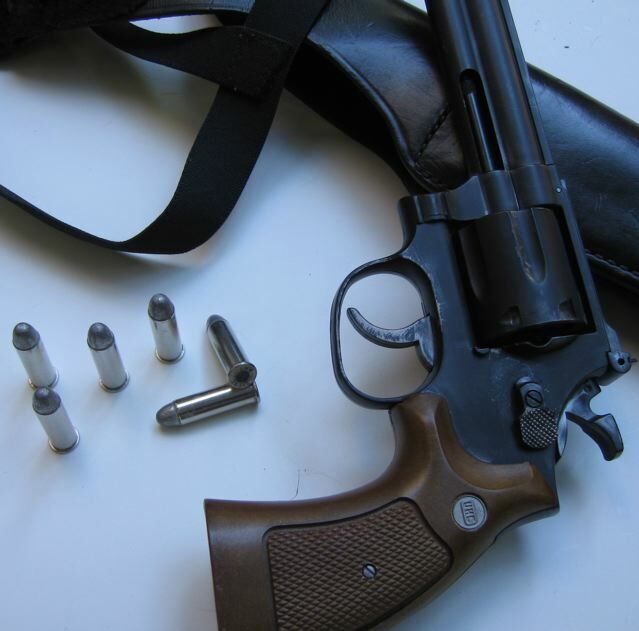 It’s a .357 S&W just like the one in the movie. It is even loeaded with deactivated .357 bullets. 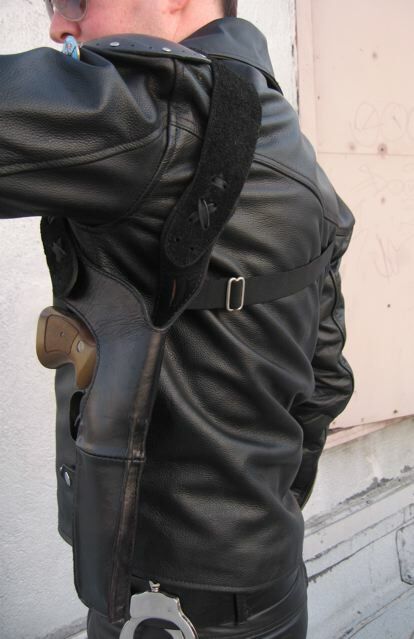 The shoulder holster for the revolver is a custom one I had done recently. 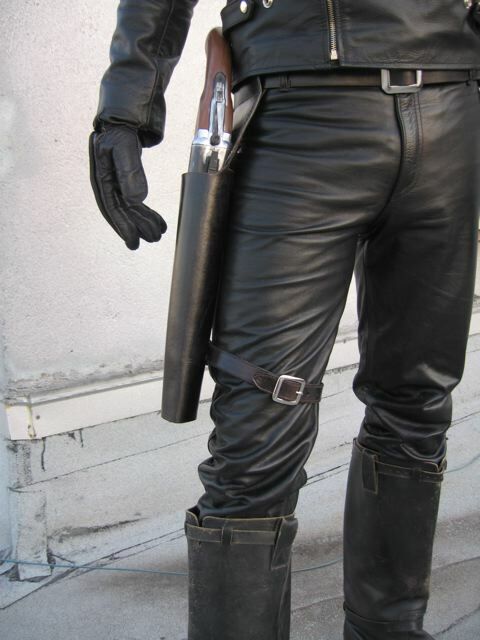 I believe it’s the most accurate copy of the movie holster that I’ve seen. It has a split-open front like Max’s (this detail was only visible to me in one of the promo photos for the movie.) 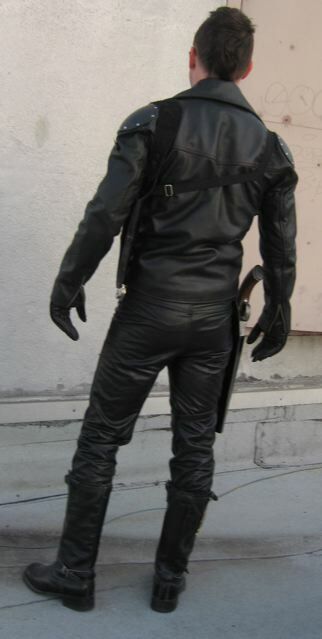 Note: In the shots of the jacket from the back, you’ll see that the holster strap is at an angle, this is not how it normally looks. It usually goes straight across, I just put it on in a hurry and couldn’t see that it was on a little off-kilter. The badge and pin set is from Abbyshot. The additional badge on the boot is not from Abbyshot, it’s a metal one I got on eBay. The two badges look very similar and I haven’t actually made up my mind as to which of the two is more SA. The night stick/billy club is not 100% SA, but it was the closest real wooden club I could find for now.